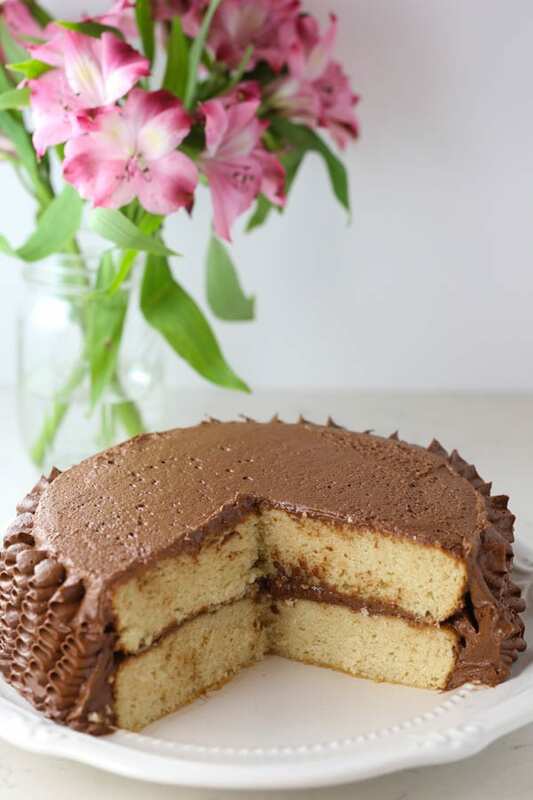 Gluten Free Vanilla Cake with Chocolate Buttercream is the perfect birthday cake for someone special that can’t have gluten. Did I make this cake for a special occasion? Nope. 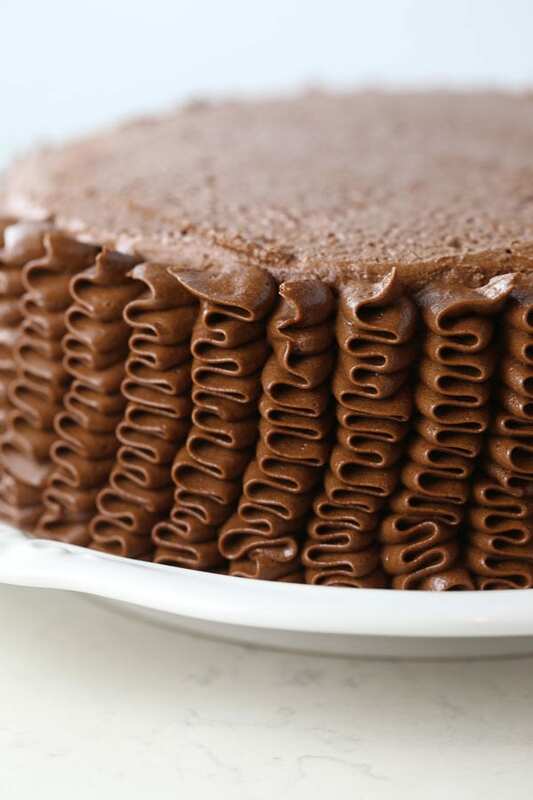 Did I make this cake because I’ve always wanted to make chocolate buttercream ribbons? Yep! And I wanted to make it gluten free so that my daughter could have it too. She’s the only one in the house that can’t have gluten, so she can’t eat most of the store bought treats and gluten free bakeries are few and far between. I also have a husband and a son who both have a very big sweet tooth! If I haven’t baked something in awhile, they let me know. “Can you make something sweet, mom?” says my basketball loving 13 year old son who is ALWAYS hungry. I also get in trouble if I bake too much. I can’t win! LOL! 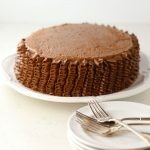 I used My Favorite Gluten-Free Flour Blend for this cake and it worked just great! It’s a recipe that I recently posted to the blog and I’ve been using it for lots of gluten free bakes. Check out my recent posts The Best Gluten Free Cinnamon Rolls or The Best Gluten Free Waffles or Naked Lemon Cake with Fresh Flowers. All tasty and you’d never know they’re gluten free! The chocolate buttercream ribbons were so fun to do. And easy too. I used a 104 pastry tip which is normally used for creating roses. 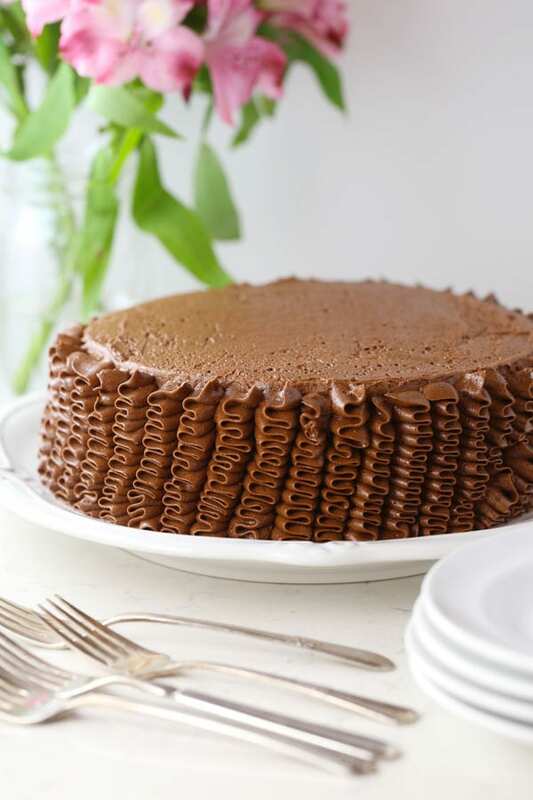 Use the wider side of the tip next to the cake as you pipe a vertical zig-zag pattern all the way up the side of the cake. Then repeat that over and over until all sides are covered. 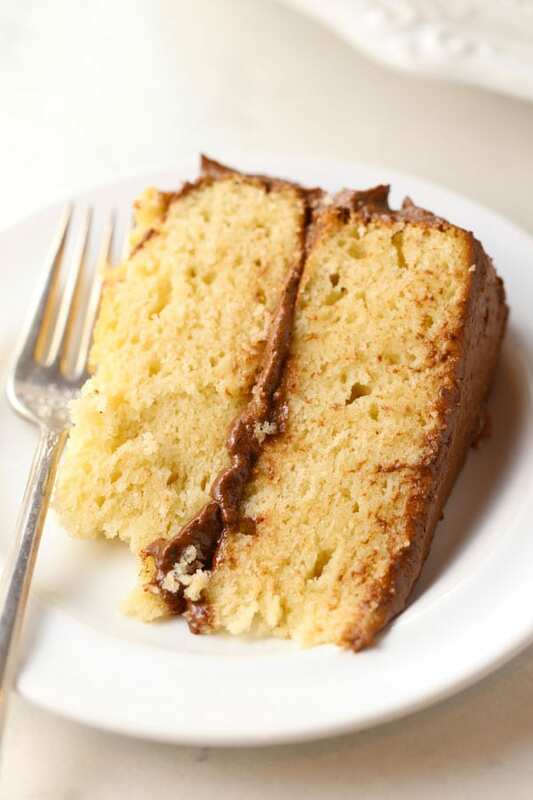 I hope you will make this Gluten Free Vanilla Cake with Chocolate Buttercream. It would be wonderful as a birthday cake or just because you’re craving something sweet without gluten. Enjoy! 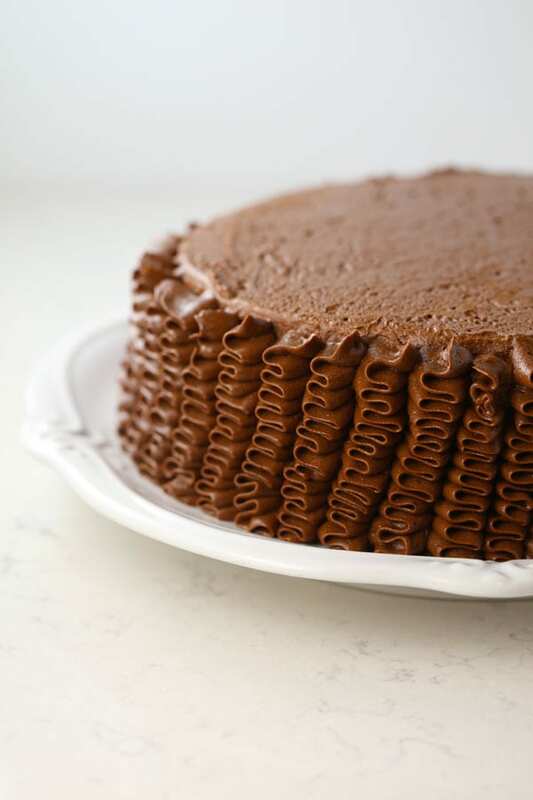 Gluten Free Vanilla Cake with Chocolate Buttercream is the perfect birthday cake for someone special that can't have gluten. Preheat oven to 350°F. Line 2 round 8-inch pans with parchment paper and spray with non-stick cooking spray (I also spray underneath the paper). Set aside. In a medium bowl, add all of the dry ingredients for the cake. Whisk together. Set aside. In a large bowl, beat butter and sugar with an electric mixer until creamy. Gradually add the eggs (one at a time) with mixer on low, letting each egg combine with the butter and sugar before adding the next egg. Once all the eggs have been added, mix on medium for 15 seconds. Measure almond milk and add the vanilla to your measuring cup. With mixer on low, alternate adding the dry ingredients and almond milk mixture. Once you've added all of the dry ingredients and milk, turn mixer up to medium and beat for 15 seconds or until batter is smooth and all of the ingredients are combined. Pour batter into prepared pans. Bake for 30-35 minutes or until a toothpick inserted into the middle of the cake comes out clean. Let cool. In a large bowl, beat butter with an electric mixer on medium for 3 minutes. Turn down to low and gradually add the powdered sugar, cocoa powder and almond milk (add 4 tablespoons at first, then if it's too thick, add more). Once you've added all of the ingredients, continue mixing on low until everything is incorporated. Then turn mixer up to medium and beat for 3 minutes. Fill and frost the cooled cakes with a thin layer of frosting. Pour remaining frosting into a large pastry bag fitted with a 104 tip. 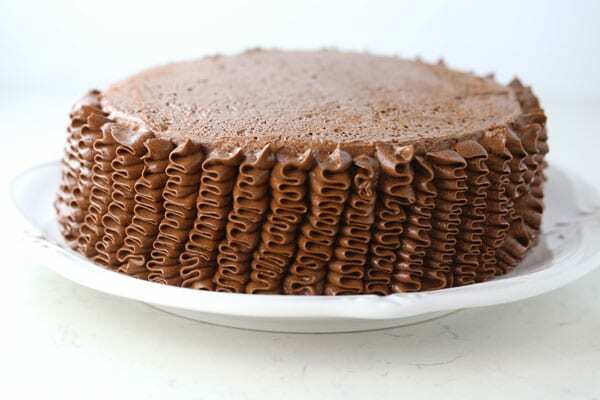 With the larger side of the petal almost touching the cake, pipe a vertical ruffle going up the side of the cake. Repeat with this same decoration right next to the one you just did and continue all the way around the cake. Slice and serve. Store covered at room temperature for 24 hours or refrigerated for up to a week.